Check the Rouzan Community Calendar for upcoming events. Be sure to scroll forward to make sure all of the upcoming events are on your calendar. This is an example of the calendar that we will use throughout the year to keep residents updated on community events. If you would like to add something to the calendar, please email the development team for consideration. You can see we have considerable infrastructure under construction in the commercial component. Once completed, Rouzan Avenue will be completed which we anticipate opening in March of next year. 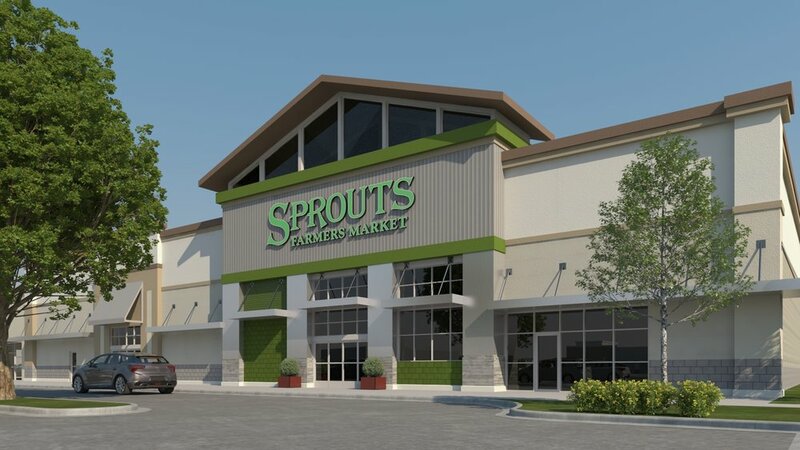 The Sprouts Grocery Store is currently under construction and is slated to be complete and open for business by April/May 2019. The developer of the Sprouts tract is planning a large “living wall” as well as landscaping and the installation of trees along Perkins — including the removal and replacement of the current sidewalks. We are currently evaluating/pricing two options for the landscaping that will be installed along the Perkins side of the building. Our design will feature trees on both sides of a 6-ft. sidewalk that are being designed to create a tree canopy over the sidewalk. This landscaping will be installed on Glasgow from Perkins to Rouzan Square Drive and along Perkins from Glasgow Avenue to Rouzan Avenue. We are working with Tessa and Derrick Holloway, owners of Kidz Karousel Child Development Centers to finalize a location to build their sixth early childhood development center in Louisiana. 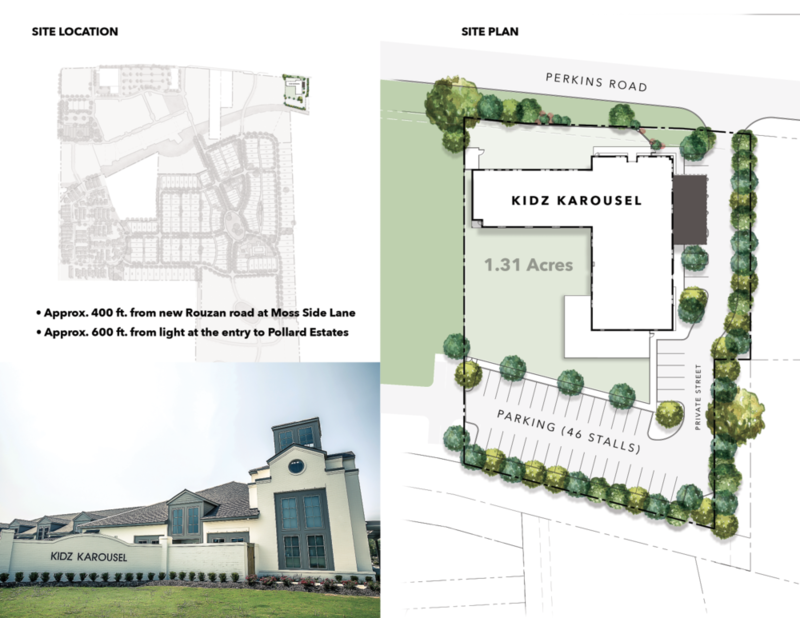 Kidz Karousel will provide full-time child care services and educational programs for children ranging in age from 6 weeks through 5 years old. Before-school and aftercare services will be available to children 6 to 12 years old. The facility will offer services from 6 a.m. to 6 p.m. year-round — including holiday care and summer camp. This will be a huge asset for Rouzan. We have received unanimous approval of our Clear Creek neighbors in support of this important project. The Metro Council has approved the purchase agreement for the library site. The due diligence period for the City expires on March 14th with the closing occurring on or before April 13, 2019. We are adding an extension to Rouzan Square Avenue to accommodate the library. We are in the process of amending the TND Concept Plan for the library and the extension of Rouzan Square Avenue. We are working with numerous restaurants and commercial businesses to find the appropriate locations. While we cannot detail any of the prospective businesses at this time, I can assure you we will have a lot of good news to come on this in the future. We are very excited about the design of the bridge which will link the residential component to the Town Centre. The bridge is scheduled to be delivered in April/May and will take approximately 60-90 days to install with full completion of the bridge anticipated for early Summer. The license plate readers have been ordered and will be installed soon. The readers will read and record all license plates entering into the residential neighborhood and check them through a City/Parish administered data bank to determine if the car is stolen or is subject to some police action. It will also provide a record of anyone coming into the neighborhood around the time of any issue that we may have. The cameras are very expensive, but we are willing to make the investment in the safety of our residents. We had numerous meetings with the leadership of Woodchase Subdivision and Pollard Estates Subdivision. I am pleased to advise you that those two subdivisons will install similar readers at the entrance of Pollard Estates at Perkins Road and Quail Run Drive which will create coverage at entrances for all three residential neighborhoods. We have elected to convert the two commercial parcels to single-family residential lots. Parcel K — located along Glasgow Avenue — will have 17 lots. Parcel D — adjacent to the existing Phase 5 Residential Component will have 8-12 residential lots. We feel that these are more compatible with our residential component, and a more appropriate transition to the Library Tract. The installation of new street lighting has been completed in the new residential areas. We are now beginning to install the new street lighting in the existing residential areas and anticipate completion in approximately 6 weeks — weather permitting. We are currently finalizing the planting of our new street trees. In all, more than 600 mature trees have been planted as a part of this effort. The latest group of trees was just delivered to the site and will be installed as soon as possible — weather permitting. We will start replacing dead trees in the existing residential component next week and should be completed within the next 30 days. 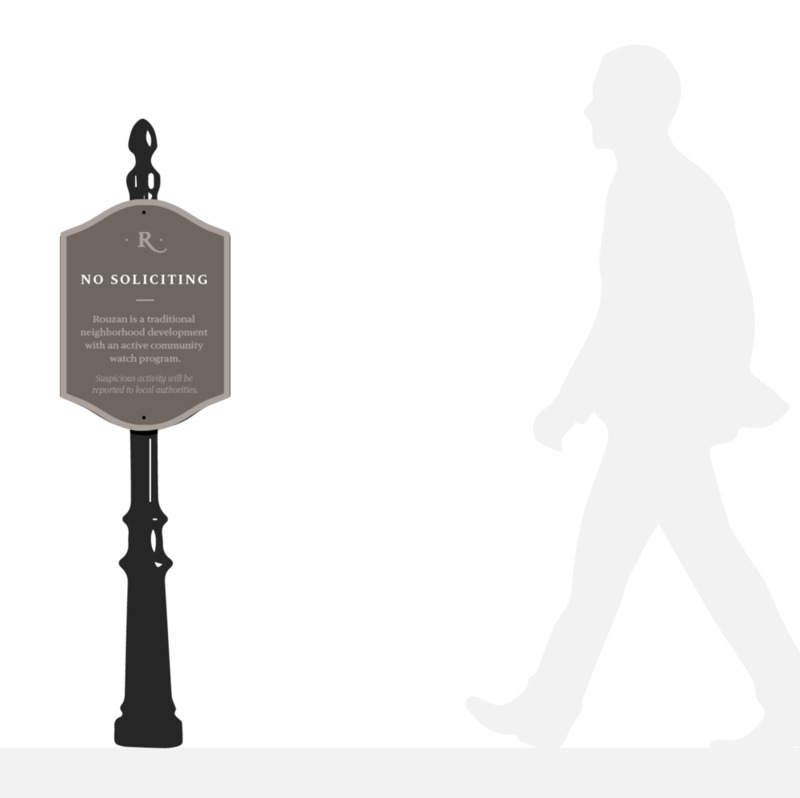 Because there has been some unwanted door-to-door solicitation in Rouzan, we are designing and will install “No Solicitation” signs for the community. Once the signs are installed, if you see any unapproved solicitation you should call the police. This was a recommendation that we received from a resident which we were happy to implement. This will be a long-term planning process, but we are considering the installation of permanent video cameras in specific locations throughout Rouzan. This initiative is just underway and will likely take several months before we will make a decision on how best to proceed. We have retained consultants to help advise us on this matter. We are awaiting final DHH approval for our pool plans. 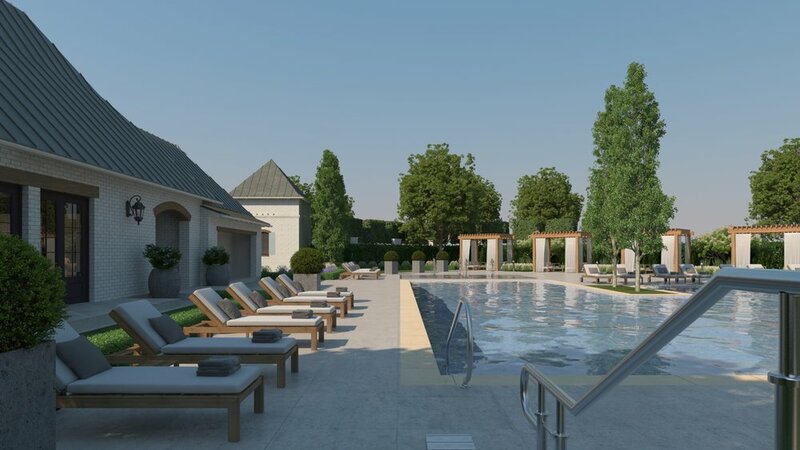 The contractor for the construction of the Community Clubhouse, Fitness Center and Community Pool has been selected and we hope to be starting work in March with an anticipated completion approximately 10 months from the start of construction. Construction of the Children’s Playground equipment is complete. In the coming weeks, we will construct a temporary fence around the playground which will be replaced by the permanent fence and landscaping as part of the construction of the Community Clubhouse, Pool and Fitness Center. We are also in the process of receiving and installing the rubberized play surface. Upon installation of the equipment, we observed that one of the slides is only accessible via a rock climbing feature. We are working to retrofit the equipment to add an additional means of access to that slide. THE MAIN CHILDREN’S PLAYGROUND IS NOT FINISHED. We must install the rubberized surface and make other safety modifications to the equipment. Until the above improvements are made, we ask that you not allow your children to play on the equipment and that all activity on the playground equipment is AT YOUR OWN RISK. We are planning to locate the second small playground area in the green space located off the Albizia Court alley. We are currently selecting equipment and will provide everyone with an estimated date for completion once the final equipment has been ordered. Unlike the Main Children’s Playground, this equipment will be installed directly on the ground and will not have a concrete and rubber base. We received numerous requests from residents to add this park, and after careful planning, we are happy to implement their recommendations. This image is for illustrative purposes. We are exploring options similar to this model. Over the last two months, a team of restoration experts cleaned the silos and have remedied all of the exposed openings as well as sealing and fortifying the structure. We are in the process of finalizing our lighting and signage packages. Our site planning efforts lead by nationally recognized Farmer D are also progressing including features like a children’s garden, raised beds, a production field, a small barn, event space and outdoor living space. We hope to have a plan finalized within the next 60 days. It was our plan to get the restoration of the silos completed before we started any installation of the community garden. As always, we encourage each of you to provide us with any recommendation or comment that you may have. You have seen from the information provided above that, when and where appropriate, we are happy to implement resident suggestions. Keep in mind that a number of your recommendations require consideration and planning prior to implementation. Some things take longer to accomplish than others and we appreciate your input. Please feel free to use the form below to submit additional questions or recommendations as needed. We would like to continue to encourage you to contact City Police if you see something that is unusual and causes you any concerns. We have a great relationship with the City Police and the District Attorney’s office and they have each asked that you call. If you see something, please say something. We will begin driving pilings for the residential bridge starting in the coming weeks. This will likely cause some intermittent construction noise. We will only perform this work during the approved construction hours allowed by the City-Parish. We are scheduled to begin this work at the end of February or in early March. The piling driving should be completed within two weeks. We apologize in advance for any inconvenience. The Baton Rouge Police Department has requested to use the rear portion of the Rouzan development for training purposes. In an effort to support our local law enforcement, we have agreed to allow for their training exercises. We do not anticipate this activity will burden our current residents. We have agreed to allow the Police Department to use the unimproved portions of the Rouzan development for training exercises on an as-needed basis — and will provide you with advanced notice of these exercises. We feel this increased presence only serves to improve the overall safety of our neighborhood and the surrounding areas. We are consolidating our construction debris collection and removal process. Our builders have started using a debris removal service that should contribute to the timely and efficient removal of all construction-related garbage. We continually update the Rouzan website to provide additional information as it becomes public. That said, we will provide all relevant information directly to residents. Complete the form below and a representative of the developer will contact you regarding your inquiry/request promptly.